It takes 4 to 5 years for Bald Eagles to get white head feathers. Eagles are usually visible along the trail, there are several nest sites in the area and many eagles use the same perch tree or rocky overlook every day. 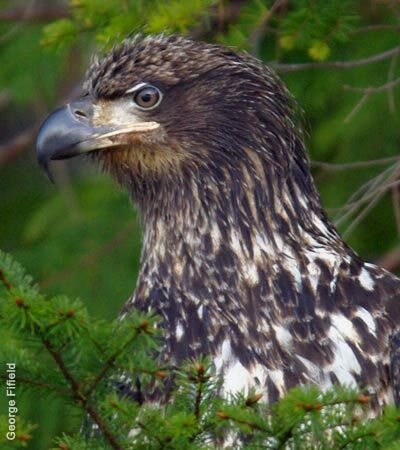 When salmon are returning to streams in the fall eagles are less common on the trail. Maps are at the trail head for your use or you can download this map to carry with you. The most enjoyable way to watch for wildlife is to choose a bench and watch for birds and and marine animals to pass by. Many interesting creatures are small; watch your step for slugs crossing the path, listen for tree frogs singing, and if you smell a strong fish odor you probably just missed a river otter! Whale spouts just offshore are common in the spring migration, but can be seen up to the fall. If you wish to get closer to whales there are many local tour boats to choose from. Please stay on the trail to reduce your impact on sensitive plants and small creatures under foot such as mussels and barnacles that live on the rocks. Many people visit the trail, help us keep the setting pristine! Read below about discouraging wolves. 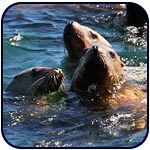 Watch the water for seals, sea lions and whales. If you notice seagulls grouped in an area they are usually attracted by a school of fish or a mammal hunting. You may even spot a sea otter – newly returned to the coast after near extinction. 31 species of marine mammals have been recorded in the waters of coastal BC, one-quarter of all marine mammal species in the world. Birds are also abundant in this area. 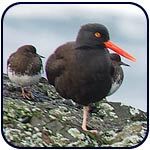 Species frequently near the trail's coastline include oystercatchers, turnstones, mergansers, great blue herons, belted kingfishers, bald eagles, osprey, and a long list of shorebirds. The forest also supports a great variety of species for bird watchers. Please take care to not disturb birds, especially during migration when they are vulnerable to starvation if they are not allowed to feed. Control your dog at all times. WILDLIFE ENCOUNTERS - Dogs may attract a predator, leash your dog to protect yourself and your pet. People have not been hurt by wild animals while hiking this trail, but dogs have been attacked when they are off leash. Encounters with bears, cougars or wolves are rare, but these animals are present. Help keep wildlife wild by staying on the trail and packing out your garbage. Predators are a natural part of the environment and will try to avoid humans if they do not smell food. Wildlife notices are posted if an animal is reported in the area (please report sightings to the numbers below). Don’t leave food or food waste near the trail. Wildlife, especially bears, conditioned to seeking human food or garbage must often be destroyed. Keep your distance if wildlife is seen. If you encounter a wild animal; stay calm and talk loudly to the animal in a confident voice. Do not run or corner the animal. Shout and wave your arms to scare the animal away if they do not flee. Staring or taking photographs teaches animals to trust humans. Habituated animals are caused by people, but it is the animal that pays with their lives if they loose their fear. 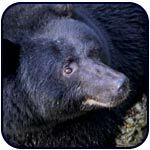 Report sightings to BC Conservation: 1-877-952-7277 or Parks Canada at 1-877-852-3100. Conservation officers can monitor animals and haze them to teach fear, but they need your reports. 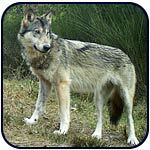 Please do your part in keeping wildlife wild, click to read this brochure to learn more about wolves. If you are jogging the trail in a less populated areas or very early in the day, consider running in groups so animals can hear your approach. If you are concerned consider carrying an air horn or canister of bear spray in the unlikely chance you surprise an animal. You do not need to spray the animal, only the space in front of you. The spray creates a curtain that the animal will not cross. Most important - preditors are attracted to dogs off leash, even on sidewalks.